While drinking some Tennessee sour mash last night with my brother, I learned that he has a Shooting Crony Beta Master chronograph. Well, that's one less thing I need to buy. 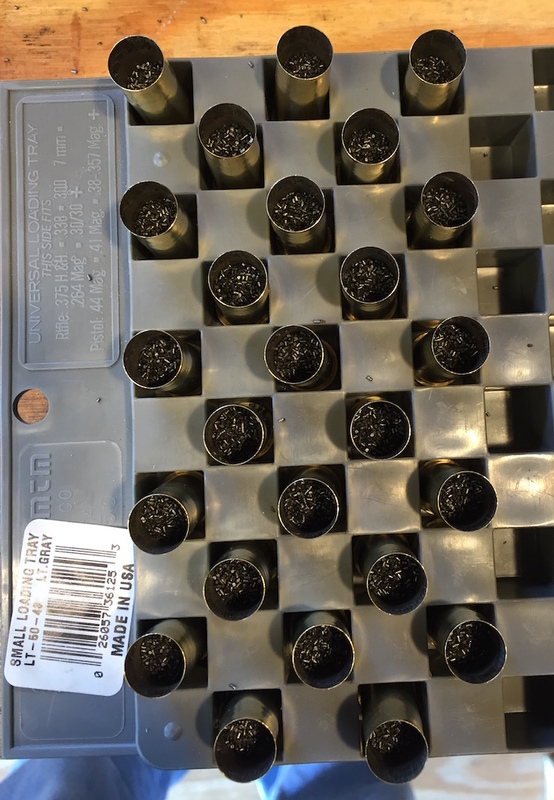 This morning I loaded up the last 7 bullets that I cast in my original Winchester mold. Powder charge was 2.2cc (about 35 grains) of Swiss 3Fg. I also resized some of the .430 200 grainers that I bought from cowboybullets.com down to .429, and loaded 25 of them them on top of 23.5 grains of Alliant Reloder 7. I'm not sure if you can see it but the Reloder 7 fills the case up nearly to the bottom of the neck. My choice of this powder stems from this thread on cascity.com, along with some other discussions found online. Note that in the CAS City thread, the author used 240 grain bullets, while I loaded 200 grain bullets. Because of Reloder 7's relatively slow burn rate, it offers the potential of duplicating or bettering the original ballistics while keeping pressures within the limits of the 1873's toggle link action. If accuracy is acceptable this should make a good hunting load. On the other hand, Reloder 7's slow burning rate means that it's probably not a good choice if you're loading cartridges to be shot in revolvers. I'm hoping to chronograph both loads, along with some of my handloads with 8.6 grains of Unique next weekend. While I was in reloading mode, I decided to get myself a digital scale, a Frankford Arsenal DS-750. It will be verified with my Lyman calibration weights and checked against my Redding No.2, which is a great piece of equipment. The digital scale will be easier to read and take up less room on my bench, however. Today I shot my .44 WCF Cimarron Uberti 1873 Sporting Rifle with two variants of smokeless loads and then with black powder cartridges. The two batches of smokeless loads were shot first. Both were loaded with 8.5 grains of Alliant Unique and 200 grain cast bullets. The first batch were from an old box of Lyman .429 hard cast with a moly lube, while the second batch were .428 soft cast from Desperado Cowboy Bullets. Both loads shot to the same point of aim and grouped about the same. Either would hold the black of an SR-1 target at 50 yards offhand. Recoil was very mild, similar to the low power commercial cowboy action shooting loads. After cleaning the bore of the smokeless lube residue, I put 50 rounds of black powder cartridges through the rifle. They were loaded with 35 grains of Swiss 3Fg with a 200 grain soft lead bullet cast in an original Winchester mold. The bullets were lubed with a mix of beeswax and mutton tallow with a little canning paraffin. The bullets in the black powder rounds dropped from the mold undersized, at about .425 - .426. I was hoping that the soft lead would bump up but based on my group at 50 yards, they didn't bump up enough. The group was about 8" offhand, not particularly good. I'm looking to develop a hunting load that will do 4" or less at 100 yards from a bench. However, I was very pleased with the minimal amount of fouling in the bore and on the cases. 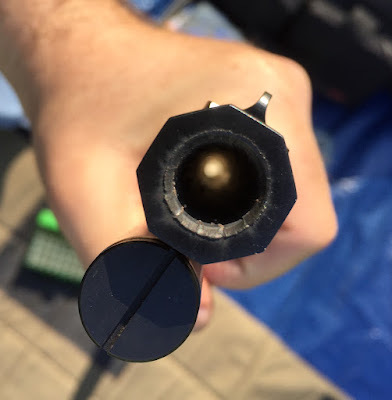 Even after 50 black powder rounds there was no crud buildup in the bore, and no sudden deterioration in accuracy (such as it was). When I cleaned the rifle afterwards with MPro-7, all it took was two wet patches (running both sides through the bore). When I ran the first side of the third wet patch through it came out clean. With this bullet style, lube, and Swiss powder, I could probably shoot 100 rounds without it fouling out. Before I cleaned the rifle I took a picture of the muzzle, showing the nice "lube star," indicating that the bullets carried enough lube for the length of the barrel. The rifle's action stayed clean. The thin .44 WCF brass expands under the pressure of the full load to seal the chamber and prevent fouling from getting back into the action. One problem I ran into today was that about 1/3 of the BP rounds didn't feed smoothly into the chamber. They seemed to hang up on the case mouth, indicating that the crimp wasn't uniform or deep enough. All the BP loads were assembled using the Winchester Model 1882 tool, while the smokeless rounds were loaded on my Lee Classic Turret press. All the smokeless rounds fed smoothly. The next time I use the Winchester tool I'll need to pay more attention to the crimping operation. Even though the accuracy of the BP loads wasn't acceptable they were a good proof of concept, in that I've found a style of bullet that with the right lube will allow me to shoot at least 50 rounds without the bore fouling out. Also, the smokeless loads will make for good plinking rounds when I'm feeling lazy about cleaning the rifle the same day I shoot it. My club is having a lever action match next month and I'll probably use the remaining smokeless rounds in it. Well, not really "smokeless," since I used Alliant Unique, and anyone who's ever loaded cast bullets on top of it knows that's it's relatively dirty for a smokeless powder. Between the powder and bullet lube there's a fair amount of smoke. Anyway, tonight I loaded up the 45 remaining 200 grain .428" cowboybullets.com projectiles on top of ~8.5 grains of Unique. Last night I'd setup my Lee Perfect Powder Measure by mounting it to a piece of scrap 1x4. I was going to load up some rounds after that, but my brother came over and we wound up in my living room with some sour mash. And of course, alcohol and reloading is a bad combination, so I didn't load any rounds until tonight. After setting the measure I weighed every 10th charge or so. I need to work on my technique but I figure the loads are consistent enough for plinking. Using the Lee powder measure is a lot faster than an undersized dipper or RCBS Little Dandy rotor and then bringing the charge up to weight with a powder trickler. Once I finished loading those rounds I primed another 50 cases using the Winchester Model 1882 tool. I've come to really like the Winchester tool for priming because it gives a great feel for how the primer is being seated. The only downside to it for this is that it's slow, compared with using a Lee hand primer. 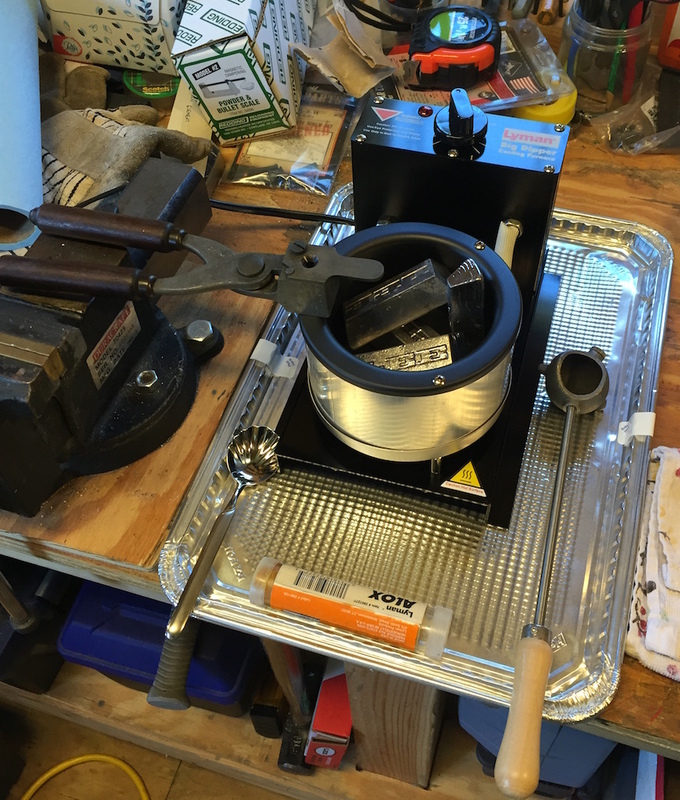 I also received a few things today: 10 pounds of 20:1 alloy and 2 pounds of tin wire cut into chunks, from Rotometals, and a Lee .429 sizing kit. Before I cast up my next batch of .44 WCF bullets I'm going to add some tin to my soft lead, to get it to fill out the mold better and shrink less after casting. After I go through the soft lead I'll try the 20:1 alloy. Tomorrow I'm expecting another package from cowboybullets.com, with 500 of the same 200 grain bullets I'd ordered before, but this time sized to .430. If they'll chamber in my Cimarron 1873 rifle, great, otherwise, I'll size them down to .429. These will be reserved for smokeless loads. Windows users should be aware of is the fact that Apple is discontinuing development of QuickTime for Windows, so it's time to uninstall it. There are known vulnerabilities that will not be patched. QuickTime .MOV files can be played in iTunes or VLC. A few weeks ago when I shot my Cimarron 1873 Sporting Rifle with black powder loads I discovered that the bullets I'd used from cowboybullets.com didn't carry enough lube to keep the fouling soft in my rifle's 24" barrel. I was able to get about 15 to 20 shots between cleanings with the ammo loaded with Swiss powder, but the cartridges loaded with Goex fouled out in about 10. Tonight I pulled the bullets from the 40 remaining rounds loaded with Goex. I pulled the first one or two with a RCBS collet bullet puller but then switched to a Frankford Arsenal impact puller, which uses the momentum of the bullet when you hit the unit against a hard surface. The impact puller was easier to use with the .44-40 rounds because there isn't much straight area on the bullet for a collet to grab onto. After pulling the bullets and returning the powder back to the Goex can, I belled the case mouths in preparation for loading them. I have 45 bullets of the original batch left, and I'll probably load them on top of ~8.5 grains of Unique. This coming Saturday I'm planning to shoot the rifle again with a previous batch of Unique loads and the 50 rounds I finished loading last night, using bullets cast from the original Winchester mold and 35 grains of Swiss 3Fg. 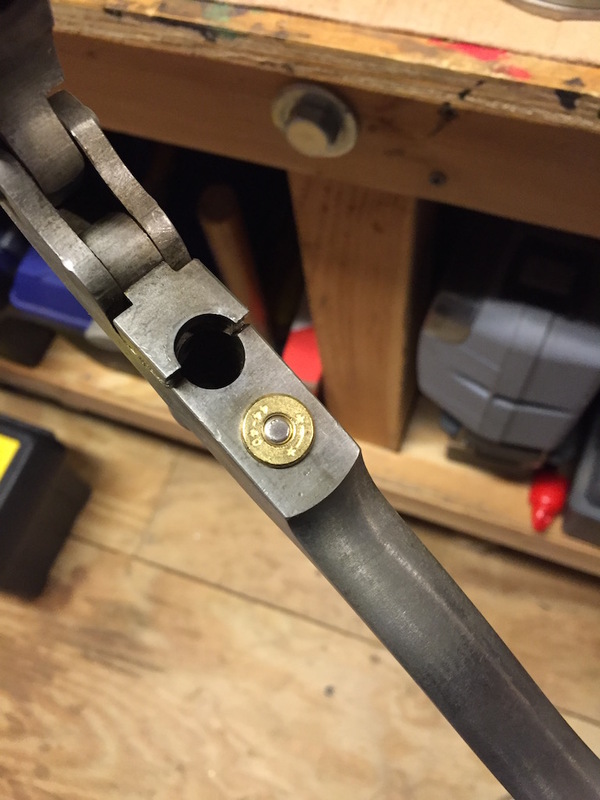 Today I loaded my first .44 WCF rounds with the Winchester Model 1882 tool. 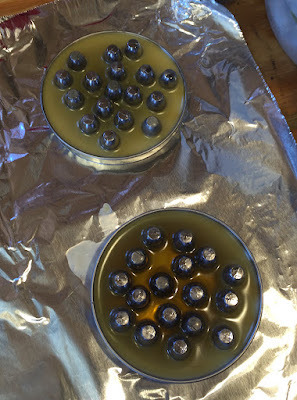 Since I'll be shooting the bullets I cast yesterday unsized, I pan lubed them with my homebrew mix of beeswax, mutton tallow, and a little canning paraffin. An electric hotplate was used to melt the lube. In the picture above, the lube in the top pan has mostly cooled while the lower pan still has some liquid lube in the center. Once the lube solidified I used needle nose pliers to pick out the bullets. In the picture below, you can see the loading tool with a cartridge in the seating chamber, a complete cartridge, a round with the bullet waiting to be seated, and a lubed bullet. When used with the components it was designed for -- .44 WCF case, black powder, and a bullet cast from the Winchester mold -- this tool is very easy to use. Because the seating chamber is not adjustable, it has to be used with bullets cast from the matching mold in order for the cartridge to have the correct overall length. Also, because the bullet doesn't have a crimp groove, it needs to be supported by a full case of powder or powder plus a filler, to prevent it from telescoping into the case under the pressure of the magazine spring. 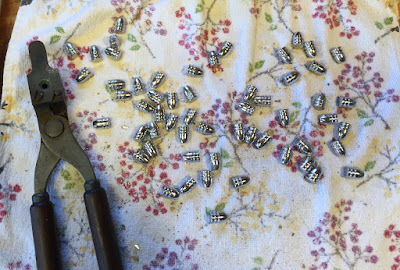 I only had time to load 15 rounds today but plan to finish up a box of 50 later this week. I'm hoping to get a chance to try them next weekend. 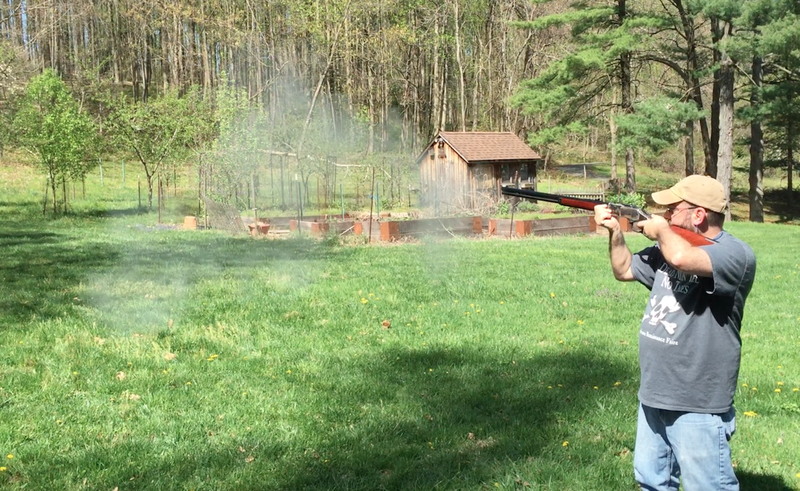 This morning I cast some bullets to load in .44-40 WCF cartridges for my Cimarron Firearms Uberti 1873 Sporting Rifle. The mold I used was the antique Winchester mold that I got off eBay a few weeks ago along with a Model 1882 loading tool. The tool and mold were made between 1882 and 1914. The furnace is sitting on a couple disposable cookie sheets to catch any spills. The lead was purchased on eBay. It's dead soft so it is probably reclaimed plumber's lead. According to information I've read online, original 19th Century black powder .44 WCF cartridges were loaded with pure lead bullets. The mold is in good condition for its age but when I got it the sprue plate retaining screw was stuck. After a few weeks soaking in Kroil I was able to remove it this morning without too much effort. I think it was just a crud buildup because there didn't seem to be any rust on it or in the hole in the mold block when I removed it. To warm the mold I let it sit on the pot as shown above, while the lead was melting. I then got it up to a good temp by casting some bullets, which wound up back in the pot. This was the first time I'd cast bullets in a couple decades, so I'm pleased with today's output. Before taking the picture a bunch of wrinkled bullets from when the mold was too cool had gone back into the pot. I measured a few with a digital caliper and they seem to be dropping at about .425 to .426, which is on the small side. However, they may still be usable in my rifle when loaded on top of black powder. Because they are soft, the sudden jolt from the black powder charge may bump them up to fill the throat and grooves. The only way to know for sure will be to load them up and try them. However, I suspect that I will need to add some tin to my lead. 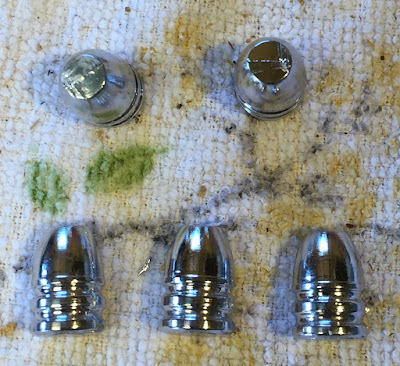 All cast lead bullets shrink a bit when they cool but adding tin not only hardens the lead, it reduces shrinkage. 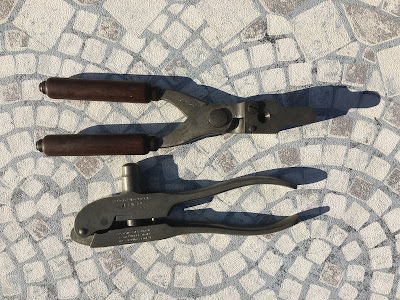 As mentioned in previous posts, I picked up a couple 19th Century reloading tools to load ammunition for my .44-40 WCF Cimarron Firearms Uberti 1873 Sporting Rifle. Tonight I gave them their first use in my hands by priming 50 cases. I primed 25 each in the Ideal Number 6 and the Winchester Model 1882. The cases were new Starlines which I'd previously belled the case mouths on my Lee Classic Turret press. The first tool I used was the Ideal. Here's a case just after priming. This one shows how a small rod is used to press the primer into its pocket. The Ideal seats primers in the same way. There wasn't much difference between the tools. The Ideal is a little heavier because it has a built-in bullet mold. Both give you a good feel of how the primer is being seated. I didn't time myself but it probably took about 20 - 30 minutes to prime 50 cases. Now I need to cast some bullets using the original molds and load up some more black powder cartridges. Always double check the charges thrown by your powder measures! Today I wanted to load up some smokeless rounds for my .44-40. According to this manufacturer's chart (PDF), the Number 16 rotor for the RCBS Little Dandy powder measure throws 8.4 grains of Alliant Unique. Well, with my rotor and the particular can of Unique that I have, it throws only 7.6 grains, as checked on two different scales. That's quite a discrepancy. If it went in the other direction, i.e., throwing a heavier charge, it could damage my rifle. I wound up putting together 50 rounds of .44-40 with 8.5 grains of Unique and a Lyman 200 grain RNFP with moly lube. 8.0 grains is a pretty standard CAS load, while 9.0 grains would be max. Splitting the difference should give me a good plinking round for the Uberti 1873 Sporting Rifle. On the other hand, 7.6 grains of Unique under a 158 grain bullet appears to be a middle of the road charge for .357 Magnum. I'll load some up and see how they do in my Rossi 92 and perhaps one of my .357 revolvers. 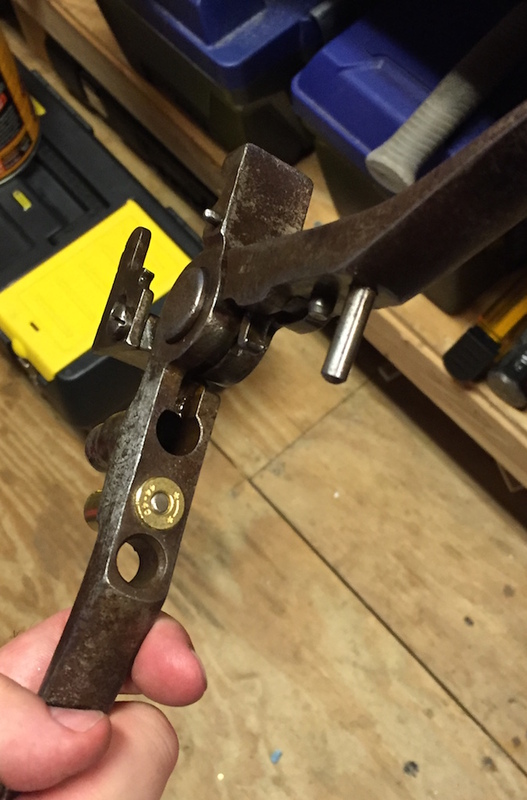 As mentioned in my earlier post, I won an eBay auction for a Winchester Model 1882 reloading tool and matching bullet mold. Winchester made these tools between 1882 and 1914, so they are bonafide antiques. After getting them I found them to be in good condition, but they had a solid covering of dirt and surface rust, including some minor rust in the mold's cavity. This is what the reloading tool looked like after soaking in Kroil and being scrubbed with some fine steel wool. 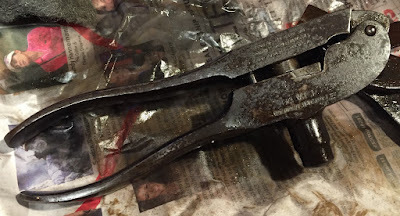 Still rather grungy, and I wanted to stop the rust, which otherwise would eventually severely damage the tool. So, I soaked both it and the mold sans wooden handles in Evapo-Rust. This removed what little remained of the original blueing but it got rid of the rust. I may reblue the reloading tool, but the mold will probably take on a blue color with use. The screw retaining the sprue plate is frozen in place, so I may take the handles off again and soak the whole thing for a week in a penetrant to try to free it. Today I made another score at a gun show. I found an Ideal Number 4 reloading tool for .44-40, for $80. Like the Winchester set it's missing the decapping pin and powder measure but still has some of the original nickel plating over the steel. I was able to remove the sprue plate screw without much effort. This design was made from the mid-1880s up until the 1930s. 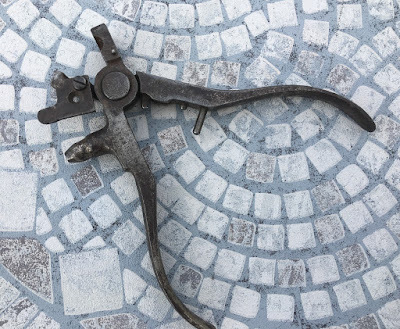 It is the ancestor of the Lyman 310 tong tool, which is still manufactured to this day. I gave it a wipe down with some WD40, Kroil, and steel wool and got off some of the rust. The mold cavity had a little rust inside but it seems to have wiped out. Combining the reloading tool and mold into one unit makes sense for a tool that will see use on the frontier. The tool also incorporates a bullet sizer. The large pin sticking out from the inside on the handle is used to push a bullet through a properly-sized hole in the opposite handle. The bullets cast in both the Winchester and Ideal molds look to be virtually identical. This makes sense, since they both are designed to duplicate the original factory bullet used in .44-40 cartridges. Lyman, which purchased the Ideal Tool Company, sells molds for the same design today, as their #427098. One thing to note with the original bullet design is that is lacks a good crimping groove. It was designed to be supported on a case full of black powder, to prevent it from being forced back into the case when loaded in a tubular magazine rifle. The bullet doesn't get that support when loaded over less-bulky smokeless powder. Another thing to note is that neither the Winchester nor the Ideal tool resize spent brass. So, while cartridges loaded in one of these will work in the same gun in which they were fired, they may not fit easily into the chamber of another rifle. Both of these tools are somewhat limited, in that because the bullet seating/crimping chamber is nonadjustable, you can use them to load ammunition only with bullets cast in their molds. Also, they are cartridge-specific, unlike the Lyman 310 tool or modern reloading presses, in which you can get different dies for different calibers. These tools are interesting pieces of history that can still be used. I do plan to try reloading with them, and will post follow up reports when I do.